Last week, I came across this discussion thread on Twitter. 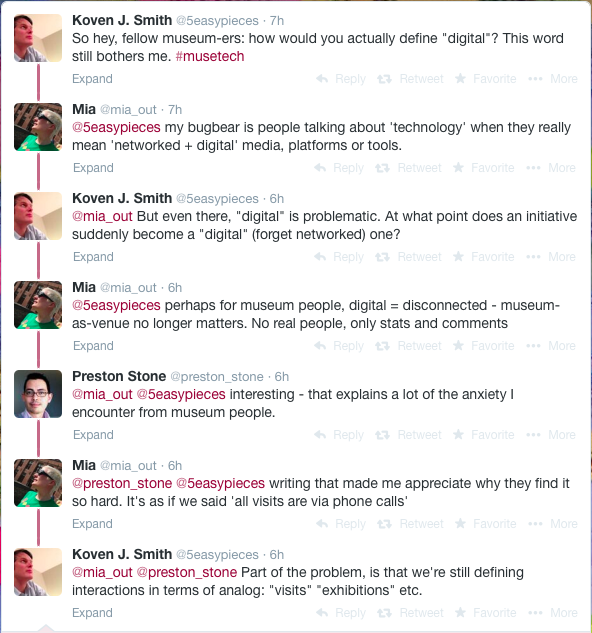 To me it’s interesting because it pins down some of the problematic aspects of integrating digital practices (whatever they may be, hence the opening question) into museum communication. 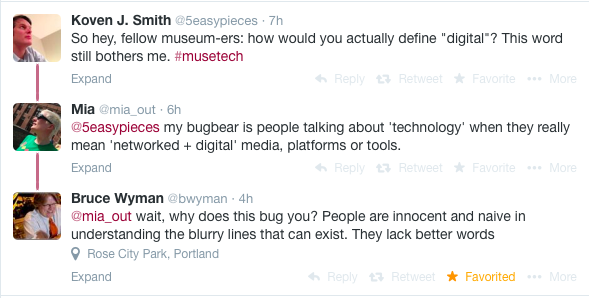 I cannot help notice the ‘us-and-them’ rhetorics – in this case ‘us’ being the museum technologists (Koven J Smith being a museum consultant and Mia Ridge being a PhD researcher, both coming from a tech background and both key actors in the Twitter and conference based #musetech community) and ‘them’ being the ‘traditional’ museum professionals; i.e. curators, conservators, educators etc. But still I think the hesitance described, the notion that digital interactions are somehow disconnected, colder, and not as valuable as onsite visits, is very right. Bruce Wyman’s comment reflects well the discussions that took place in the two workshops I held with professionals from Designmuseum Danmark, in which ‘app’ became shorthand for any kind of mobile tool, ‘semantic web’ was mentioned as the way forward, but nobody (myself included) could quite pin down what it meant, QR codes became ‘QRL’s (in a mash-up with URLs) etc. Here was a group of highly accomplished professionals, masters of their respective fields, but relative newcomers to the digital domain, vast and rapidly evolving as it is. Little wonder that they did not have full command of concepts and lingo. And the feeling of uncertainty, of not quite understanding what the possibilities are and how to select a strategy and move forward, is surely not helped by this constant demand for ‘getting with the program’ while simultaneously being told – or talked about as if – you’re not getting it or not getting it right. Rather, it might breed scepticism or resentment. And anyway, when the tech in-crowd struggles to define digital, its not so strange that everybody else are also a little confused. Which reminds me of a really interesting debate that took place at this year’s Sharing is Caring seminar, one that still sticks with me as it kind of touches on a central conundrum in my research. (For the record, I’ve been off with stress for a few weeks, which is why I didn’t get round to blogging about the seminar back in April. Back now, and better although still slightly dizzy, so blogging is a strategy for getting back in the game). After both presenting keynotes, Nick Poole – having spoken about the love of museums as a key driving force for staff and visitors alike – and Simon Tanner – giving a presentation on impact assessment – launched into a discussion about whether institutional development should essentially be guided by evidence or confidence. Obviously, success can be a bit hit and miss. Simon Tanner therefore argued, that in order to ensure that our strategies and efforts really have the intended impact, and adjust accordingly if they don’t, we must gather and analyse data that shows what actually happens, how they are experienced by the public, rather than following gut feelings and hype. While this is a valid and rational point, the problem remains that it takes a lot of time to produce evidence (and still your evidence only answers the questions you set out to explore, but not all the other aspects that may have given you a different result). Nick Poole therefore took the position that as culture and society evolves too quickly for science to keep up, development should not be stalled by the idealistic call for evidence. Furthermore, as evidence can only tell us about the past, but not foresee the future, we have to rely on our beliefs when deciding on how to move forward. To support this view, he cited that the greatest leap of institutional development – in the 19th century – was precisely guided by belief, not evidence (thus ironically using evidence to back his claim, but still a good point, not least as museums are currently attempting to make an equally significant leap into a digitalised, networked and democratic future). The outcome of the discussion was of course a compromise, an agreement that we have to combine the two, and let investments follow the projects that we believe will have the greatest impact rather than simply stick to what we feel most comfortable with, and subsequently evaluate and learn from our mistakes. I attended the seminar together with my museology class, which worked as great learning experience. Interestingly, in our follow-up discussion, they picked up on the tendency for presentations to have a touch of the motivational speech: little criticism was raised, and rhetorics were at times a bit to idealistic and flowery (e.g. Nick Poole’s talk about love; it’s all well and good but how do you put that into practice?!) – which had also bugged me when I first attended Sharing is Caring in 2012. This time I was less bothered. Was that because the evangelism had been turned down a notch, because I had adjusted my expectations, or had become wiser or simply lost my critical mojo? Either way, a lot of interesting issues have been raised in this seminar series, and now the contributions from the 2011 and 2012 editions have been collated in an anthology edited by Merete Sanderhoff. The anthology, which addresses ‘the changes and opportunities brought about by digitisation, digital media, and the internet for the cultural heritage world and – not least – our users’ comprises 18 articles by Danish and international museum professionals, scholars, public sector administrators and others. It presents a wide range of cases and viewpoints, and is not only well worth a read, but also freely available for download from SMK’s website. Now that’s sharing the love.